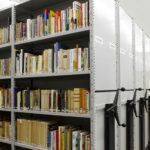 Most of the library’s holdings fall under this category, comprising about 48,000 individual monographs and miscellanies on southern Africa in general and Namibia in particular. Other thematic focus areas include German colonial history, Swiss in Africa, and current fields of research in the sphere of African studies. Individual editions of journals and bibliographies may also be found in this category. Any books published before 1918 are located in the Rare Book Collection.